Chinese President Xi Jinping has arrived in Hong Kong to mark 20 years since the territory was handed back to China by Britain. The highly symbolic visit, Mr Xi's first since becoming leader in 2012, comes amid an increasingly tense political climate. Several well-known activists were arrested on the eve of Mr Xi's arrival. 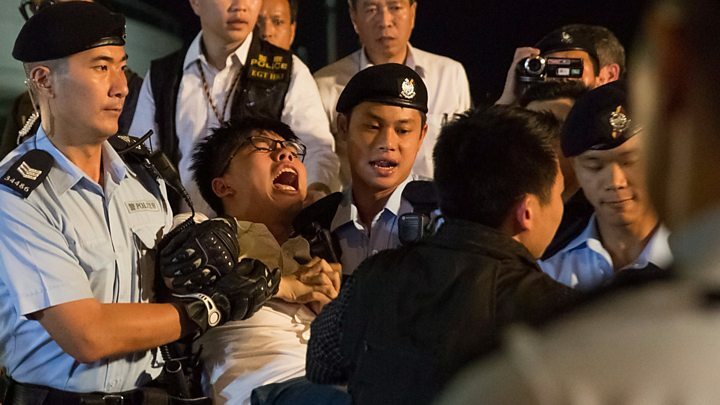 The group, which included student leader Joshua Wong, had staged a protest at an iconic sculpture symbolising the handover. The golden sculpture of a bauhinia flower - Hong Kong's emblem - by the city's harbour was a gift from China. 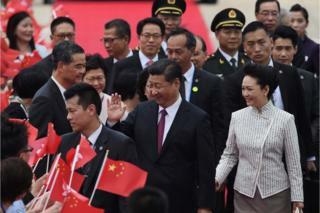 Mr Xi arrived for the three-day visit with his wife Peng Liyuan at the city's main Chek Lap Kok airport. The couple were welcomed by a marching band and children waving flags. In a brief speech on the tarmac, he said Hong Kong was "always in my heart". Beijing's central government "has always been a strong backer of Hong Kong" and "will, as always, support Hong Kong's economic development and improvement of people's lives". He also said Beijing was "willing to work with all sectors of Hong Kong's society in maintaining Hong Kong's extraordinary journey these past 20 years", and would "ensure 'one country, two systems' will continue with stability". Beijing agreed to govern it under "one country, two systems", granting the city its own legal system, limited democracy with multiple political parties, and rights like freedom of assembly and free speech. Golden geese and democracy 'infections' - did predictions come true? A series of official celebrations are planned for this weekend, as well as the inauguration of Hong Kong's incoming chief executive Carrie Lam. But parts of Hong Kong are under a tight security lockdown amid worries of further protests, with several major roads closed and sections of the city centre blocked off from the public. Thousands of police officers are being deployed across the city and along the route Mr Xi's motorcade will take when it enters the city. When former president Hu Jintao visited for the 15-year celebrations in 2012, he was met with hundreds of thousands of protesters, marching against what they saw as Beijing's stifling influence on political reform in the city. Tensions spilled over into mass protests in the city centre in September 2014, with calls for full democracy and the resignation of then-Chief Executive CY Leung.